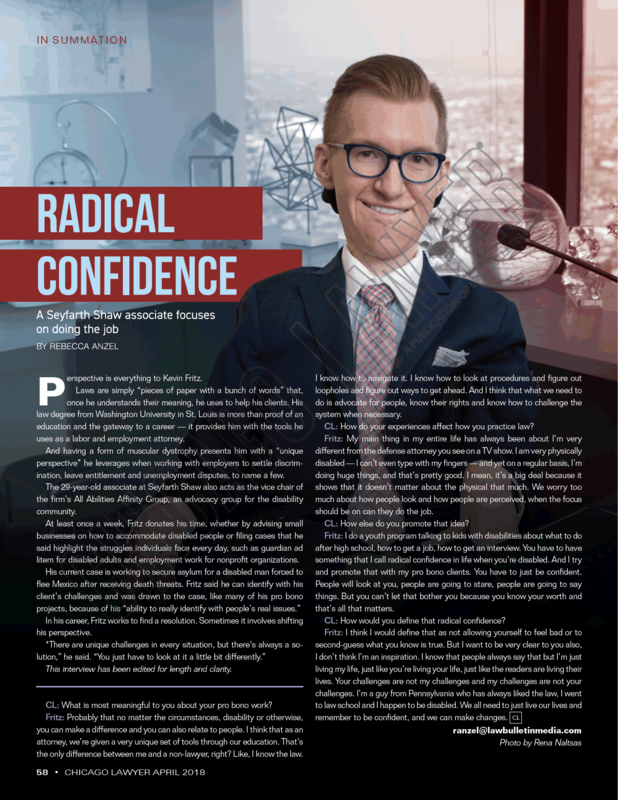 Chicago Lawyer Magazine published this piece in print in April 2018. Perspective is everything to Kevin Fritz. Laws are simply “pieces of paper with a bunch of words” that, once he understands their meaning, he uses to help his clients. His law degree from Washington University in St. Louis is more than proof of an education and the gateway to a career — it provides him with the tools he uses as a labor and employment attorney. And having a form of muscular dystrophy presents him with a “unique perspective” he leverages when working with employers to settle discrimination, leave entitlement and unemployment disputes, to name a few. 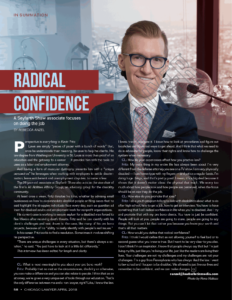 The 29-year-old associate at Seyfarth Shaw also acts as the vice chair of the firm’s All Abilities Affinity Group, an advocacy group for the disability community. At least once a week, Fritz donates his time, whether by advising small businesses on how to accommodate disabled people or filing cases that he said highlight the struggles individuals face every day, such as guardian ad litem for disabled adults and employment work for nonprofit organizations. In his career, Fritz works to find a resolution. Sometimes it involves shifting his perspective. CL: What is most meaningful to you about your pro bono work? Fritz: Probably that no matter the circumstances, disability or otherwise, you can make a difference and you can also relate to people. I think that as an attorney, we’re given a very unique set of tools through our education. That’s the only difference between me and a non-lawyer, right? Like, I know the law. I know how to navigate it. I know how to look at procedures and figure out loopholes and figure out ways to get ahead. And I think that what we need to do is advocate for people, know their rights and know how to challenge the system when necessary. CL: How do your experiences affect how you practice law? Fritz: My main thing in my entire life has always been about I’m very different from the defense attorney you see on a TV show. I am very physically disabled — I can’t even type with my fingers — and yet on a regular basis, I’m doing huge things, and that’s pretty good. I mean, it’s a big deal because it shows that it doesn’t matter about the physical that much. We worry too much about how people look and how people are perceived, when the focus should be on can they do the job. CL: How else do you promote that idea? Fritz: I do a youth program talking to kids with disabilities about what to do after high school, how to get a job, how to get an interview. You have to have something that I call radical confidence in life when you’re disabled. And I try and promote that with my pro bono clients. You have to just be confident. People will look at you, people are going to stare, people are going to say things. But you can’t let that bother you because you know your worth and that’s all that matters. CL: How would you define that radical confidence? Fritz: I think I would define that as not allowing yourself to feel bad or to second-guess what you know is true. But I want to be very clear to you also, I don’t think I’m an inspiration. I know that people always say that but I’m just living my life, just like you’re living your life, just like the readers are living their lives. Your challenges are not my challenges and my challenges are not your challenges. I’m a guy from Pennsylvania who has always liked the law, I went to law school and I happen to be disabled. We all need to just live our lives and remember to be confident, and we can make changes.